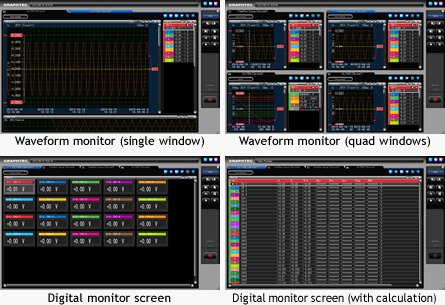 It can measure the desired signal according to the needs and can expand into other applications adding different amplifier modules. Measurements for different applications can be added to the amplifier module. 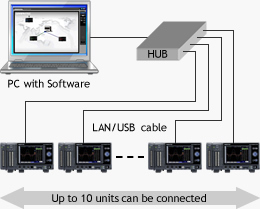 It is also possible to mix measurements by adding different types of modules. The Voltage module, Voltage/Temperature module, High Speed Voltage module and Logic/Pulse models are available. The other modules will be released sequentially starting in the autumn of 2012. *1: Using in Logic mode, the module can be attached up to 7 units. *2: Using in Pulse mode, module can be attached up to 2 units. *3: SSD module is an option. Number of channels for pulse input will be limited when the High-speed voltage module and Logic/Pulse module are used simultaneously. 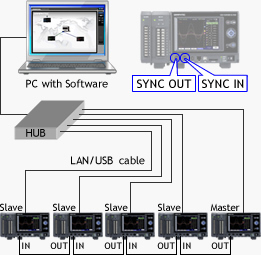 Up to 5 units of the GL7000 can be fully synchronized using the sync. Cable The start/stop trigger, and sampling can be synchronized in the GL7000 when they are connected by a sync cable. The master and slave units are automatically identified. Modules will be released sequentially starting in the autumn of 2012. SD card slot (supports SDHC, up to 32GB) is standard on the main module. The captured data can be saved directly to the SD memory card when the sampling is not faster than 1ms (sampling speed: 1 k Samples/s). It supports hot-swap, so the SD memory card can be replaced during measurement without data loss. * The captured data can be transferred easily to the PC in offline condition. * The hot-swap is possible when the sampling is slower than 100ms. Allows large amounts of data to be quickly saved when the optional SSD module is attached. The captured data can be saved directly to the SSD when the sampling is not faster than 1µs (sampling speed: 1 M Samples/s). * It has a high vibration resistance and saved data is also retained even when power is turned off. * The number of modules are limited. *1: The capturing time figures are approximate. *2: The file size of the captured data is limited up to 2GB. Copyright © 2007 GRAPHTEC corporation. All rights reserved.